Title: The Pigeon Needs a Bath! GoodReads Summary: The Pigeon really needs a bath! Except, the Pigeon's not so sure about that. Besides, he took a bath last month! Maybe. It's going to take some serious convincing to try and get the Pigeon to take the plunge. What I Think: This book is stinkin' awesome! 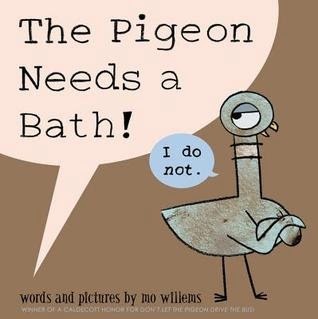 We love Mo Willems and all of his books in our house and this is such a great addition to the Pigeon books. We've read this book countless times since it arrived at our doorstep. My kids think it's hysterical and ask for it again and again. It's pretty obvious when a book rings true to kids because they totally know. My kids both totally get where the Pigeon is coming from and they totally know his words have come out their mouths before. I think that makes it even better is they know how batty arguing about bath drives their parents. 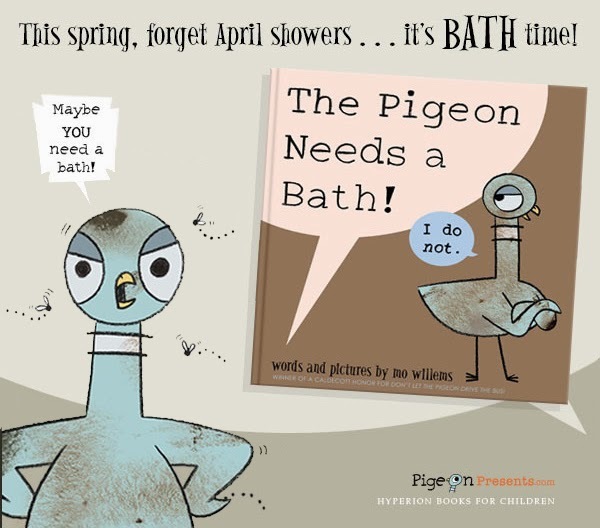 There aren't many books that my kids love so much that they know all the words (and maybe that has more do to with my kids than book....) but they know the words to The Pigeon Needs a Bath!. They love the end especially but I won't give away what happens. If you're familiar with the other Pigeon books, I'm sure you can take a guess at where the Pigeon ends up by the end. This book is so well done. I think parents and kids alike will enjoy the story because it rings so true to bath-time conversations. If I ever decide to try stand-up comedy (which will probably never happen...), one of my "bits" would be about how ridiculous I feel whenever we lose power at our house. I can't even tell you how many times the power has gone out and I wander around trying to turn on lights or use electrically-powered things like a hair dryer or the toaster and then I remember I can't because the power is out. I know full well the power is out but my brain struggles to make the connection. Personally, I think this might be an amusing story/joke to tell because I imagine others might relate to my story. Funny stories are often funny because other people can relate to the experience or the feelings. The Pigeon Needs a Bath! does exactly this. Kids take baths, kids often don't want to take baths, kids even more often are picky about exactly the conditions of their baths. Parents are definitely often exasperated with kids and baths. Because this seems to be such a universal experience, so many readers, young and old, can relate to this book. That's what makes it a gem in my opinion. As a mentor text, this book and the discussion about finding a story that others can really relate to or finding an emotion that you can help readers relate to, is such a great opportunity to talk about plot with students. Writing is complicated and finding the plot is definitely one layer that students need support with. Brainstorming some everyday stories and helping students see how they might bring those stories to life and zoom in on the experience is a great way to get students started on what they might write about. Having a discussion about what exactly Mo Willems does here and why it works so well would be a great way to look at author's purpose and craft. Writing Prompts: Write about an experience you have had that you think others might be able to relate to. Narrow the story down to a simple form but then freeze time and really focus on bringing each part of the story to life.